Differentiation between ectopic beats of ventricular origin and those of supraventricular origin but conducted aberrantly can be difficult, especially in sustained tachycardias with wide QRS complexes [wide complex tachycardia (WCT)]. In general, the majority of patients with WCT have ventricular tachycardia and should be approached as having ventricular tachycardia until proved otherwise. Several guidelines might help in the distinction. 1. A preceding ectopic P' wave is good evidence favoring aberrancy, although coincidental atrial and ventricular ectopic beats or retrograde conduction can occur. During a sustained run of tachycardia, AV dissociation greatly favors a ventricular origin of the dysrhythmia. 2. Postectopic pause. A fully compensatory pause is more likely after a ventricular beat, but exceptions do occur. 3. Fusion beats are good evidence for ventricular origin, but exceptions do occur. 4. A varying bundle branch block pattern suggests aberrancy. 5. Coupling intervals are usually constant with ventricular ectopic beats unless parasystole is present. Varying coupling intervals suggest aberrancy. 6. Response to carotid sinus massage or other vagal maneuvers will slow conduction through the AV node and may abolish reentrant SVT and slow the ventricular response in other supraventricular tachyarrhythmias. These maneuvers have essentially no effect on ventricular dysrhythmias. 7. A QRS duration of longer than 0.14 s is usually only found in ventricular ectopy or tachycardia. 8. 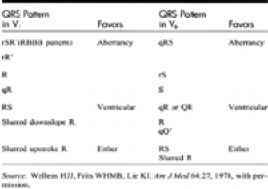 QRS morphology: Wellens et al have studied patients with both ventricular tachycardia and SVT with aberrancy using His bundle electrocardiography. Several morphologic ECG criteria were found useful in differentiating between the two (T.a.ble...,2.4.z4.). In the ED, these morphologic criteria are not helpful.